This Giant Ease E electric bike is in excellent condition. Having never been ridden, it is showing no signs of mechanical wear. However, it has some cosmetic imperfections on the mudguard and shifter. Cycle further and faster with less effort. 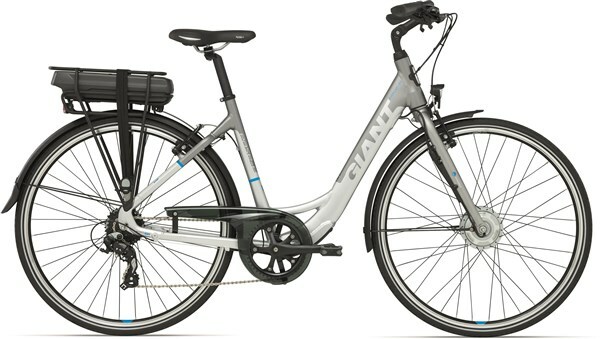 The Giant Ease-E+ is an electric hybrid bike that offers an easy cycling power boost at an affordable price point. With its modern city bike look and electric hub drive the Ease E+ offers the comfort of a traditional hybrid bicycle, with an added power boost. The electric motor supplements your natural pedalling power, all you need to do is pedal and the 250w motor in the front wheel will help you along, so that you can get up to speed with much less effort. The SyncDrive F front hub motor features a silent clutch mechanism that will help you along when you are pedalling but won’t slow you down when you are freewheeling. There are three power modes to choose from that are easily monitored and controlled through the handlebar mounted RideControl command centre. The 36v Lithium-Ion battery pack offers plenty of charge which you can manage easily with RideControl. The Shimano Alivio 8 speed drivetrain offers reliable shifting while the integrated lights will keep you visible on the roads after dark. Go Green on the Giant Ease-E+ ebike.